Green Beans and Pretzels . . .
Officially it made it to 65° here in Elkhart today with a low of 50 expected tonight. Which would have been great, except for the rain that came with it. Which meant no walking and no coffee and muffins outside with Nick and Terry. But it was a great morning for reading and computering, so that worked out well. About 1pm I drove Jan down to get her hair trimmed, something I do with great dread every time. Because since she’s usually at a different place each time, with a different stylist, sometimes she’s not real happy with her cut. And who’s the closest at hand to vent to? But today was my lucky day, (and Jan’s too, I guess) because she really liked her trim. So I dodged a bullet for another few weeks. 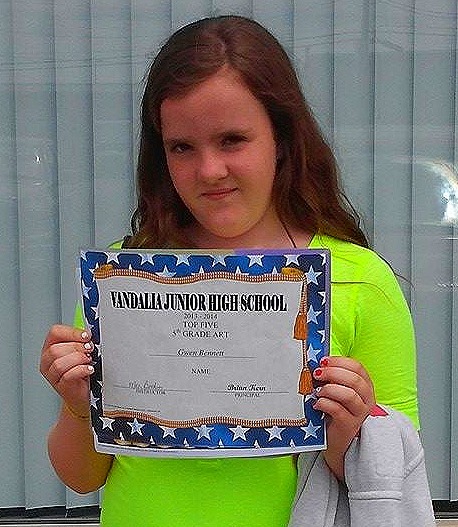 Our great-niece Gwen graduated from 5th grade today, with a lot of awards. She got a top 5 in art, a top 2 in writing, and straight A’s in Science, Reading, and Language Arts. A little before 5pm, Nick and Terry, and Jan and I drove over to have dinner at the nearby Applebee’s. And as has been our recent experiences, it was really good. Jan and Terry had the Margarita Queso Grilled Chicken and Shrimp, while Nick had the Penne Pasta with Chicken. I however, had the Grilled Vidalia Onion Sirloin that they’ve been advertising on TV recently. It also came with smashed red potatoes (that’s how they describe them) and fresh steamed garlicy spinach. The 9oz. sirloin was perfectly medium rare, just slight charred on the edges, and very flavorful. And we also had our favorite appetizer there, the Green Bean Crispers. These are lightly breaded and fried 6” long fresh green beans, served with both a BBQ Bacon Ranch dip and Zesty Horseradish dip. Nick, not believing in vegetables, have Brew Pub Pretzel and Beer Cheese Dip appetizer. They also have the Dessert Shooters, those little shot glass desserts, that are the perfect way to wrap things up, but everyone was too full this time. Don’t know if anyone else is watching the Fargo miniseries on FX Tuesday nights, but Jan and I have really enjoyed it. They’re down to the last 2 of the 10 episodes, and it will be interesting to see how it all plays out. Done by the same people who did the Fargo movie back in 1996, the TV show has no direct connection, except the Minnesota location and a really quirky story. If you haven’t seen it, hopefully they will rerun it at some point. It’s worth seeing from the beginning.